If you would like to cut costs hire a qualified, licensed electrician to install a ce iling fan in your home or office. Not only is a ceiling fan a cheaper and more energy efficient way to cool your home, a beautiful ornate ceiling fan ceiling fan also adds to the decor and aesthetic quality of a room. Get the air moving in your home with a great new ceiling fan, call Sylvia Electrical Contracting today for a free estimate! We have three convenient locations in Peabody MA, Fitchburg MA and Boston MA. With the ability to increase the comfort, value, and beauty of your home, indoor and outdoor ceiling fans are a truly worthwhile investment. Today, there are countless ceiling fan options on the market, from budget-friendly, "builder grade" fans to more elaborate, with ornate styling like that of a fancy chandelier. Call a Boston electrician, electricians or electrical contractor for a free estimate. How do you go about choosing the right one, with so many options available? Just follow these easy guidelines! 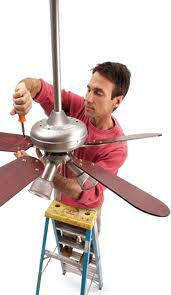 And when you are ready to install your fan call the expert electricians at Sylvia Electrical Contracting. Choose a high-quality motor. Contrary to popular belief, it is the quality of the motor (not the design or appearance) that you are really paying for in a ceiling fan. The difference between high-quality and the lower-quality fans is all in the motor. Lower quality fan motors usually have a thin metal covering, which can cause rattling and other unpleasant noises when running. High quality fans, on the other hand, have a heavy gauge steel motor case. These motors are both quieter and more aesthetically pleasing. Choose An Outdoor-Specific Fan for Outside. Outdoor-specific fans are made with more durable materials to withstand the elements, whereas indoor fans are not. Indoor ceiling fans installed outdoors will eventually swell from humidity, resulting in unsightly drooping and lowered performance. While browsing outdoor fans, always consider the climate where you live and the area of the home where you'll install the fan. UL "Damp" rated fans can be used under a covered porch or patio, but you'll need a "Wet" rated fan for use in more open areas like gazebos. Consider the Ceiling Fan's Efficiency and Air Movement. Although almost all fans can help you save on your air conditioning bill, models that are Energy Star rated are particularly efficient. When measuring efficiency, the key factor is airflow: how much air can this ceiling fan really move? This is determined by the quality of the motor, the angle (or pitch) of the blade, and material of the blade. The best angle for residential ceiling fans is considered to be 14 degrees, which provides the most airflow; the best materials for fan blades are laminates (as opposed to solid wood), because of their strength and resistance to warping. Choose the Right Size for Your Space. An electrician in Peabody, Fitchburg, Boston can help you make the right decision. 400 square feet: Multiple fans are recommended. Accessorize Your Ceiling Fan. Some fans are sold in individual parts, while others are all-inclusive. Whether you'd prefer the flexibility of customizing your own design or the convenience of an all-in-one package, is up to you. Fan Down rods are usually sold separately, and allow you to provide optimal airflow in your space (particularly for high ceilings). At the other end of the spectrum, "hugger" kits allow you to fit your ceiling fan to fit low ceilings (many fans come equipped with these, so check before you order). Fan remote controls and wall controls offer added convenience.